Pammy Blogs Beauty: Despirately Seeking SPF: My Spring/Summer Roundup of SPFs for Face and Body! Despirately Seeking SPF: My Spring/Summer Roundup of SPFs for Face and Body! It is that time of year...time to talk SPFs! Wearing SPF is a big deal for me. Not only do I have super fair skin and live in sunny Georgia, but also I have a family history of skin cancer and have lost a dear friend to Melanoma. I absolutely do not mess around when it comes to sun protection. I wear it every single day year-round. However, I really up my protection during the Spring/Summer and apply more often. As a beauty blogger with an interest in SPF, I have amassed a huge arsenal of sun protection. Plus, there is just so much available! So, I decided to share with you my current go-to picks in my sun protection rotation. No, I don't wear all of these every day. These are just the ones that I tend to reach for, in rotation, the most. I have tested them all extensively over the past year and really love each one for particular reasons, for certain parts of the body, or specific activities. Kate Somerville Serum Sunscreen SPF 50+: Have I mentioned lately that I flippin love Kate Somerville's skincare? Seriously, I am kinda obcessed! ;) Her sunscreen is no exception. This is one of my favorite Sunscreens for my face for sunny and warm Spring/Summer days. If I know that I am going to be outside a bit (which is typical for me for a Spring/Summer day: walks to the park, backyard play with my kids, gardening, lunch or dinner outside, etc) then I wear this sunscreen. I apply it in the mornings after washing my face and before makeup when I am going to have a semi-outside day. It does leave my face a bit shiny but honestly I don't mind looking a little dewy. I tend to wear powder foundations in warmer weather anyways which takes down the shine a bit. Oh, and I love the pump/tube packaging. Gotta love a pump! RoC Multi Correxion 5-in-1 Daily Moisturizer with SPF 30: I like this moisturizer because when I use it I know that I am not only getting great sun protection, but I am also getting its "5-in-1" anti-aging benefits! Formulated with RoC's Hexinol technology, it can help with everything from dryness to fine lines and skin discolorations. I love the feel of this moisturizer. It hydrates my skin nicely and leaves it so soft! Plus, it makes a nice base for makeup. This is certainly one of my go-to moisturizer/spfs for everyday. The SPF of 30 is great daily protection! Oh, and have I mentioned that I adore the pump? Shiseido Ultimate Sun Protection Spray SPF50+: This is a fabulous new SPF product from Shiseido! This ultra lightweight SPF spray is for both body and face. This is the SPF that I carry with me. I am always on the go with my kids and find myself in need of mid-day SPF application. This is super quick and easy to mist onto my face, arms, and legs or any exposed areas. I love how lightweight it is! It really feels like you are wearing nothing! Plus, it is water resistant and the pump is designed so that you can even spray it upside down. Love, love, love it!!! Neutrogena Clear Face Liquid-Lotion Sunscreen: This facial sunscreen from Neutrogena was specifically designed for acne-prone skin. It gives broad-spectrum coverage with a water-light texture that is less likely to cause breakouts. Now, I do not have acne, however I did have breakout prone skin in my late teens and 20s. I wish this product was around back then! This might be a great option to check out if you are breakout prone. While I don't break out often, I do have some trouble with some products clogging my pores and causing breakouts. I like to wear this sunscreen when I know I am going to be in the sun while sweating and I don't want that mixture of sunscreen and sweat to clog my pores. So, this is a go-to for an active outside day. Algenist Ultra Lightweight UV Defense Fluid SPF 50: Have I mentioned lately that I am completely obsessed with Algenist? Algenist continues to impress me and I have yet to try an Algenist product that I have not completely loved. Algenist's Regenerative Anti-Aging Moisturizer is my holy grail everyday moisturizer/SPF for Fall and Winter when my skin is drier and I have less sun exposure. I did not list it in this top SPFs list for one reason, the SPF of 20 is a just a bit too low for days that I have sun exposure. It is totally fine for days that I don't expect to be in the sun much. However, this post is geared more towards Spring/Summer and sunny days. ;) So, back to Algenist's Ultra Lightweight UV Defense Fluid: It has such an amazing thin liquid texture! It is completely non-greasy. I like to use this one when I know that I will be spending hours in the direct sun. Also, I like to layer this SPF over other facial SPFs as a "spot treatment" for areas of my face that tend to get more exposure like my nose. For example, if i am wearing RoC's Multi Correxion 5-in1 or Algenist's Regenerative Anti-Aging Moisturizer, I might layer the Algenist just over my nose. Love this SPF from Algenist!!!! SolScents Sunscreen: Do you love Sunscreen but crave more than your typical "sunscreen scent"? Then you might go for these SolScents sunscreens. They are a 3-in-1 Sunscreen, Moisturizer, and Fragrance. If you are a fan of Bath & Body Works type scents, you will love these nicely scented sunscreens! I like to think of these as a great swap from your typical fragranced body moisturizer without spf...for Spring/Summer, just swap out your typical daily moisturizer for one of these. You will automatically be getting sun protection while still getting a lovely scent! I tried both the Cucumber Melon SPF 30 and the Raspberry Dreams SPF 50. I would love to try more scents as I really enjoy these! Lubriderm Daily Moisture Lotion SPF 15: This is actually a year-round favorite for me! I always use a lotion with SPF on my arms and decolletage area as those are the parts of my body, besides my face, that get daily sun exposure. I am a fan of the entire Lubriderm line of products! Such basic lotions...yet, basic is so good sometimes! It hydrates your skin leaving you soft while also giving you sun protection. A win-win! Neutrogena Beach Defense Water + Sun Barrier Spray Broad Spectrum SPF 70: When at the beach (or even the pool), I need to break out the "big guns" as far as SPF protection. With my super duper fair skin AND the strong sun, I need high SPF and a formula that is going to stay in place. Plus, reapplication needs to be simple. Nothing beats a spray sunscreen for the beach! I spray my entire body before leaving the house and then reapply as needed while on the beach (sitting in the shade of course!). Plus, I love that this is both non-sticky and non-oily. Oh, and have I mentioned the scent? I just love it!!! You need this for your beach bag: a must-have!!! Aveeno Protect + Hydrate Lotion Sunscreen Broad Spectrum SPF 30: Here is another Summer day must-have! I love that you can use this sunscreen on both face and body. It is very moisturizing and offers great protection. The formula is sweat and water resistant for 80 minutes. It actually comes in 3 levels of protection: 30, 50, and 70. The slim tube design makes it great for tossing in your bag for on-the-go. I like that I can reapply it to my face at the same time that I am reapplying to my body without worrying about it breaking me out. Neutrogena Wet Skin Kids Beach & Pool Sunscreen SPF 45+: As a Mom, I am always looking for great options for sun protection for my children (I have both a baby and a toddler). This sunscreen is great for my toddler! She is very active and needs constant sun protection for her fair skin. I just love that this formula can be reapplied (and will maintain its full strength) on dry OR wet skin! Amazing!!! Plus it is water-resistant for up to 80 minutes. Between neighborhood pool-time, the splash pad, afternoons at the park, playing in the backyard, and the beach...my kids need a lot of sun protection! I feel confident that my kids are protected when they wear this! I think I need to explore the Neutrogena Wet Skin line further as we have so many outdoor activities this year...for the whole family! Aveeno Smart Essentials Daily Nourishing Moisturizer with Sunscreen: Here is another one of my favorite daily face moisturizers with SPF. In addition to sun protection (SPF 30), you are getting nice moisture plus vitamins A, C, & E! Plus, I love the pump: great packaging!!! I like the fresh scent. Plus, I like that this does not leave my skin looking nor feeling overly greasy. So, that's it ya'll! 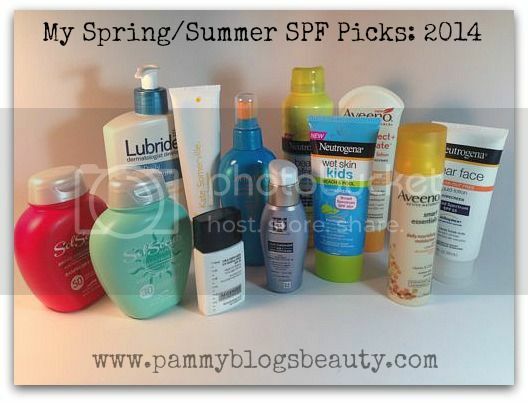 Those are my current SPF picks for Spring/Summer 2014! Sure, there are other SPFs that are great. However, in my current arsenal, these are the ones that are reached for the most! Love em all! What sunscreens are you loving lately?